"WHERE IS THE BEST GROUSE HUNTING?" I’ve always wanted to take a 3-5 day trip to one of those dream hunt locations, you know the kind you hear about and see in magazines. But where is this magical place? Does it exist? I hope it does! I’m thinking of a trip to Maine, or to the Northeast Kingdom of my own state of Vermont. But where to stay and what’s the best deal? If you’ve had a hunt of your dreams or own this magical place and would like to share the story, tell it on this sites guest book or e-mail the story to be placed on this sites guest page. After putting much thought into what you folks were telling us. We will be going to the state of Maine next fall. The place we will be staying is called Breezy Acres Camps, we've added a link to their site on our links page. We'll be giving you more info after the trip, but I will tell you this I am sure that our stay will be a good one! "The Reason I Feel So Strongly About Clear Cutting." I feel that clear cuts and burnings help the forest and all animals. I don't think that all trees should be cut down, what I'm saying is that clear cuts and burning areas help. It's not instant, it takes about ten years for the area to support wildlife best. But if we manage the forest with a small clear cut or burning and then a few years later another, next to that one, and so on. It can be like the good old days again! Can the forest take care of it's self? It could if not for us, look at what we do, we stop forest fires, we have to save homes, introduce new animals like the fisher cat to kill tree eating porcupines, and limit logging, just to name a few. By the way, I shot the big , healthy birds in the pictures above on the edge of a 15 year old burning. I think the forest needs our help. What do you think? Let us know in this sites guest book. "THANK YOU FOR NOT POSTING YOUR LAND"
I think it's the right thing to do, to thank the land owners that don't post their land. I also think it's our job as hunters to leave the land in better condition then we find it, that is by removing any trash you find in the woods. Is it just in my neck of the woods, or is it everywhere that deer seasons just keeps getting longer? It's not that I'm against it, I hunt deer a little also. But as deer season stays open longer, and they add more ways of taking a deer. I feel that, I'm having my bird season shortened. The reason I feel it's being shortened is, that I hunt with a dog and I'm not about to put him harms way, for the sake of the hunt. What I'd like to see is areas set aside for bird hunting. For hunting birds without having to worry about your best friends life, not to limit bird hunter to these areas, but to put them in place as an option, We would like to hear how you feel about this, and if any of the ideas are already in place in your area. Leave your thought in this sites guest book. 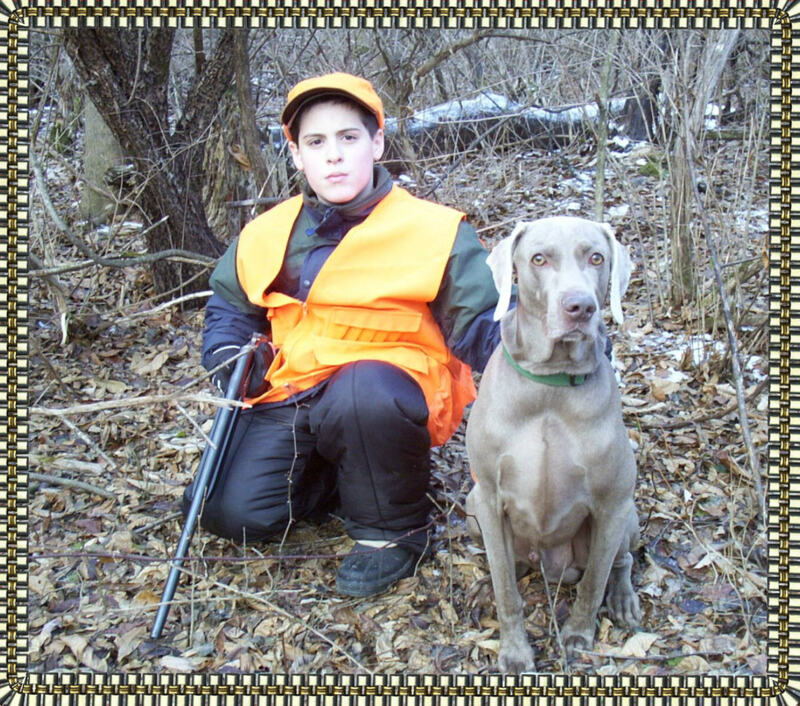 "A Hunt I'll Not Soon Forget"
"It was on a Sunday in late October that Gunner and I set out on a timed hunt, that is timed do to a family get together. I drove 20 minutes to one of my hot spots, got out and thought, " We have about 2 hours lets get on it." We walked our routine route, to let Gunner get his energy out. One flushed on that route, but no point and no shot. We worked into an area that takes more time to hunt then we had, but it had been hot the past two weekends. Gunner was working well, following all leads the birds had left behind. It had been about an hour and no flushes, so we started to move to a spot where we had seen alot of birds. On the way Gunner wanted to go to an area that was not that great, I okayed it and in we went. Now don't forget the times ticking and I want to get a shot, but o.k. Gunner what do you have? He worked in slow and about 50 yards in he locked into a point, I worked up on the point, and as I passed Gunner the grouse was off, a shot the grouse was down again. Gunner retrieved the bird to hand. I looked at my watch, it was time to head for home, it was a good hunt. I have two morals to this story, always trust your dog and adjust you watch if the time was set back the night before, as we didn't and had a hour more to hunt when we arrived home.
" 2001 SEASON WRAP-UP "
The season is over for us here in Vermont and looking back on it, I feel that it has been the best I've ever had. The best thing that happen this past season, is that my son got his hunting license and hunted with me a few times, I think he will be able to cover the ground required better in the next few years. Next is that the dog worked so hard and gave me plenty of great days. Finally, the birds were plentiful and just as hard to hit as ever!